BEAUTIFUL 3 BEDROOM + DEN HOME WITH A HEATED POOL IN A SOUTH BACKING YARD! Here is a spacious, bright and open floor plan that is great for entertaining and daily living. It has been gently used as a 2nd home (furniture is available for sale). ALL APPLIANCES ARE INCLUDED. Features include vaulted ceiling, wood flooring, built-in entertainment center, large kitchen with eating counter, upgraded fixtures, separate tub and shower in the Master Bathroom and much more. 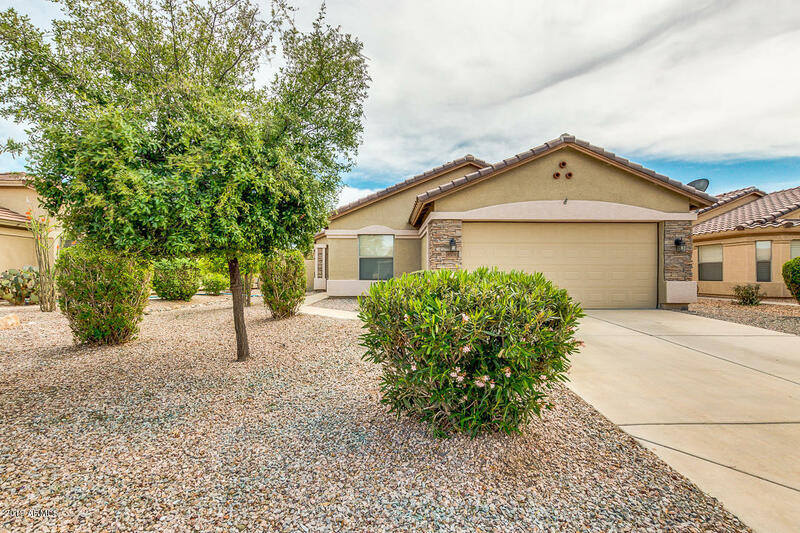 Bask in the winter sun... the yard has mature landscaping, covered patio, extensive concrete & pavers and a HEATED POOL FOR YEAR-ROUND ENJOYMENT. This is a great location in Maricopa close to shopping,dining & other conveniences...also benefit from quick access north to Greater Phoenix or west on Hwy 238 to Yuma or San Diego.